It’s been something of a tradition over the last five decades that Science-Fiction dramas created for European television have been markedly different from their American counterparts. Where writers and producers in the United States tended to see optimism and the concept of the ‘bigger-better-brighter’ future for Humanity, on this side of the Atlantic a decidedly more jaded attitude prevailed, best summed up as: ‘the more things change, the more they stay the same’. While Gene Roddenberry fixated on his imaginative TV vision of a near-perfect multicultural, multiracial future for the Human race where the struggle for territory and ethnicity, faith and ideology, would be subsumed into a utopian ‘United Federation of Planets’ (utopian, of course, as long as everyone was happy to live in a distinctly Anglo-American future), in Europe writers took a very different view of Human progress. While the faces and places, societies and technologies might change the same basic underlying instincts and patterns of human development were predicted to remain the same. Out of this more pessimistic vision was born ‘Blake’s 7’, the BBC’s answer to the blockbusting and ground-breaking ‘Star Wars’ movie that had hit the cinemas a year earlier in 1977. With a nod to George Lucas’ creation, and inspired by the tradition of dystopian Sci-Fi in Britain (and contemporary events on the streets of the UK and elsewhere in Europe), it was a bleak tale of the struggle by an escaped group of prisoners-turned-revolutionaries against a despotic interstellar ‘Terran Federation’. Penned by veteran scriptwriter Terry Nation (a regular contributor to ‘Doctor Who’ and the creator in 1963 of the definitive British Sci-Fi villains, the ‘Daleks’) it was sold to BBC bosses as ‘the Dirty Dozen in Space’ (a reference to director Robert Aldrich’s seminal movie of 1969), with inspiration from the modern folkloric view of ‘Robin Hood’ amongst others. 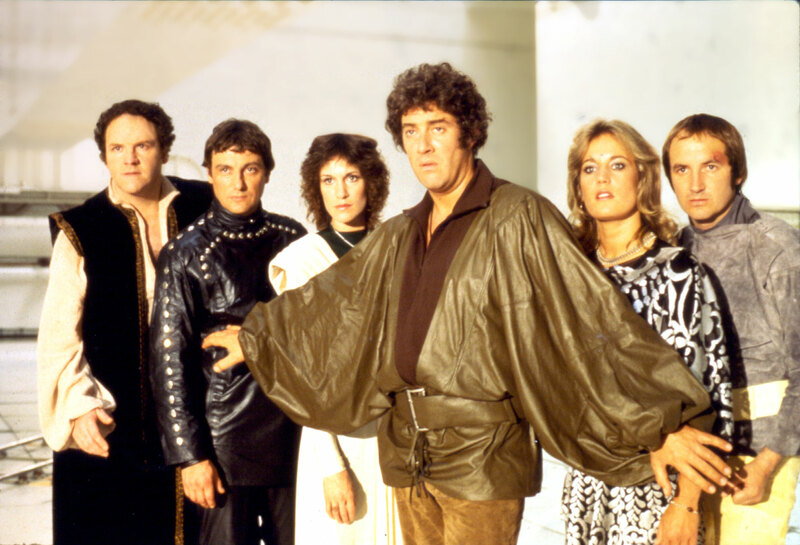 The cast was made up of relatively famous as well as lesser known British TV actors, principally Gareth Thomas as the eponymous ‘Blake’, and Paul Darrow as ‘Kerr Avon’, his mismatched partner and second-in-command (a character whose popularity eventually surpassed and outlasted Blake’s). Several others took up minor roles notably Michael Keating (‘Vila’) and actress Glynis Barber (‘Soolin’). The principal foe of the refugees was ‘Servalan’, played by actress Jacqueline Pearce (frequently in tight black leather, which did no harm to the male viewing figures) and her teeming army of Federation soldiers (actually there was rarely more than four or five on screen at any one time though they did sport rather cool helmets). The many adventures of Blake largely revolved around the pursuit of his small group of outlaws by the Terran Federation and their frequent escapes from traps laid along the way as they explored the depths of space in their spaceship, the still iconic ‘Liberator’. The stories themselves were aimed at an adult audience and contained some serious adult themes (as far as possible within the tight restrictions the BBC bosses placed upon the show’s makers). Violence, romance, greed, jealously, revenge, betrayal: all of these were regular motivating factors for the numerous characters that appeared in the ‘Blake’s 7’ episodes. Nothing was as it appeared, no simple clean-cut heroes here but instead more complex (and sometimes tortured) anti-heroes, as much to be appalled by as identified with. Characters, even popular ones, could die or disappear or suddenly turn coward or traitor. Though most episodes stood alone some were tied into narrative arcs, one of the earliest examples of such dramatic devices in Science-Fiction television, and created a sense of realism and ongoing interest for viewers who returned to see more. The dialogue could match the honesty and gritty reality of the stories and the characters, illustrating the unwillingness of the scriptwriters to compromise even there. After four turbulent and latterly uneven seasons the series came to its inevitable, and cataclysmic, end as the forces of the Terran Federation finally caught up with the escapees, creating a memorable final scene that is still hotly debated to this day. So has the passage of time been kind to ‘Blake’s 7’? Over three decades on it is easy to see the many flaws in the series. The special effects, even at the time, were less than special and no amount of generosity can escape the fact that they detract enormously from the show. The tight budgetary controls leave a distinctly ‘tacky’ air over many of the models and space-based scenes and even the sets and costumes look ridiculously dated. Much of the dialogue that seemed so radical and daring in the late 1970s now appears embarrassing and at times just plain silly. Some of the stories themselves have aged badly, and though the determination of the writers to offer up something deeper and more substantial than the usual Sci-Fi TV fare clearly shines through, the myth of ‘Blake’s 7’ is perhaps greater than the cold-eyed reality. The popularity of ‘Blake’s 7’ is reflected in the fact that no single box-set of the entire series has yet emerged, forcing fans to purchase separate DVD collections of the individual seasons, rather than a money-saving single edition. If you want to see what all the fuss is about among the mainly British Fanboy fraternity then I suggest that you buy ‘Series 1’ and sample it for yourself. But be warned: if reminiscences for times past is tempting you older Fans into a purchase of the series, ‘Blake’s 7’, though neither particularly bad nor unwatchable, is still perhaps more important in memory than it has become in reality. The myth of Blake is greater than the man, and perhaps that is where we should leave him – as a myth.